Antonio Rossellino, Madonna mit Kind, Mitte 15 Jh. 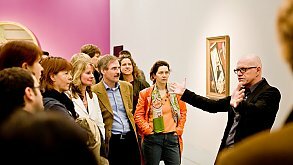 The Arp Museum Bahnhof Rolandseck in the city of Remagen – the patronage museum of the avant-garde sculptor Hans Arp – and its light-flooded contemporary structure designed by the celebrated architect Richard Meier is an ideal exhibition space for large-scale sculptures. This year the museum celebrates its 10th year anniversary and will take the opportunity to present works by one of the great modern sculptors: Henry Moore (1898–1986). In a three-part exhibition that utilizes the space around the museum, the Arp Museum will explore the multi-faceted and influential oeuvre of the remarkable British artist in a collaborative project with the Henry Moore Foundation. 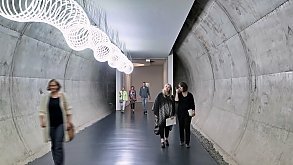 From the shores of the Rhine to the museum's front courtyard, continuing into the building complex and upwards into the modern structure overlooking the river, the presentation includes large-scale works that measure up to 9 meters wide and 3 meters high. Emphasis is placed on Moore's monumental outdoor works, which are presented for the first time in an interior space. Two additional presentations will allow for an even broader exploration of Moore's work. In juxtaposition with paintings and sculptures by old masters from the Collection Rau for UNICEF, focus will be cast on Moore's acute interest in Gothic art. At the same time a dialogue with works by Hans Arp will reveal commonalities as well as differences between these two abstract sculptors, who would set the standard for the future development of modern sculpture. 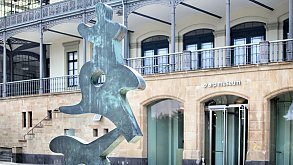 In the year 1979 Henry Moore's monumental sculpture Large Two Forms was erected in front of the former German Chancellery in Bonn. The exhibition will focus on the genesis of this work, which as a result of media coverage of political developments was for many decades the sculpture shown most frequently on German television. 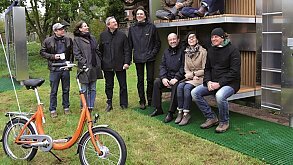 In this way Large Two Forms became a kind of artistic symbol for the Federal Republic of Germany. Newspaper articles and a photograph showing Henry Moore in the museum's historic celebration hall bear witness to the artist's repeated visits to Bahnhof Rolandseck in the 1970s. The exhibition offers a unique view of the elements that would turn Henry Moore into one of the most well-known sculptors of our age. 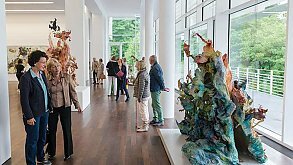 It allows visitors to be captivated by his masterful enormous bronze sculptures, reveals the artist's sources of creative energy (ranging from the Italian Renaissance to Hans Arp), and celebrates the inexhaustible interplay between architecture and sculpture, inside and outside, nature and art.